Growing up in a struggling middle-class family (where corners were cut to make ends meet), I didn’t have access to an endless supply of money to entertain myself. Any pocket money I had was earned through babysitting, mowing yards, or a night and weekend job. Since I needed to save most of my money for books and living expenses for college, I didn’t spend on frivolous things when hanging out with my friends. Now that I’m married, a mom to two kids with another on the way, and a homeowner, those money saving skills I learned during my youth have really helped me in adulthood. I freely admit to being obsessed with frugality, but I don’t ever want to let my frugality impede on my friendships. There are tons of ways to hang out with friends without spending too much of your hard-earned money. Learning how to have fun on a budget was one of the best lessons I learned as a young adult. My favorite activities from back then happen to be my favorite activities still today. 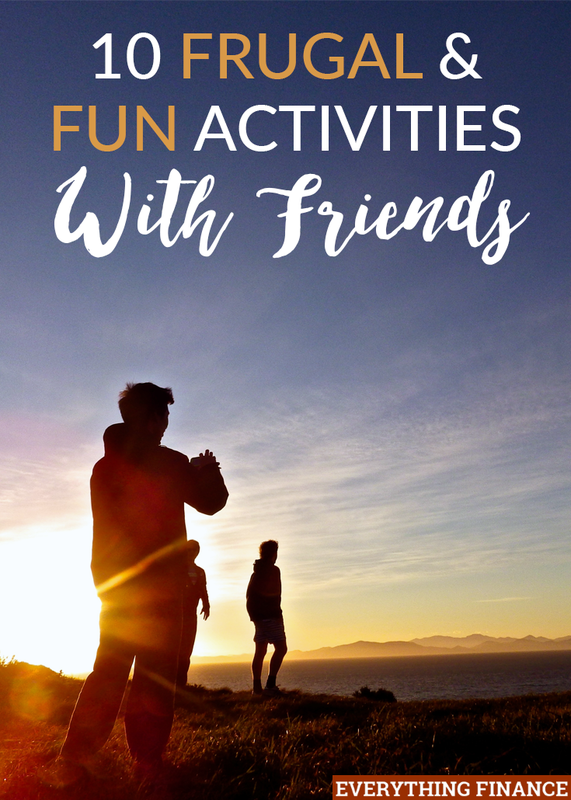 The following ten activities are my favorite frugal ways to spend time with friends while saving money. Exploring state and national parks’ hiking trails are fantastic ways to spend time with friends without spending money. Usually, you only have to pay for parking or a small fee for entrance to the park. Nothing brings friends together quite like a challenging climb to the top of a mountain. Fresh air, exercise, friendship, and the great outdoors are all priceless components to a fantastic day out with friends. Picnic lunches on the beach are another favorite because you can have them throughout the year unless it’s raining or snowing. I love packing a picnic lunch to share and catching up with friends while listening to the waves crash against the shore. Having a bonfire might sound pretty straightforward, but there are so many different ways you can hang out with friends over a bonfire. Cook over the open flames, make s’mores, pop open your favorite wine to share, or simply swap stories while you enjoy the fire late into the night. Why are movies so expensive? Going to the movies is a classic way to spend time with friends, but traditional showing times are prohibitively expensive. Matinee showings are a great balance between saving money and letting yourself indulge in a movie every once in a while. Who doesn’t love bowling? Just like movies, though, bowling costs can add up quickly, especially if they charge for the lane, shoes, and balls separately. Most bowling alleys have a discount day, though, which can be a great time to go have fun together for fifty percent or less. Our local bowling alley offers games for just $2 each on Monday, for example. When I was in high school, my group of friends and I came from very diverse backgrounds. To celebrate our heritage and those of our closest friends, we would have a “multi-cultural potluck” night where each of us brought one traditional dish to share. It didn’t cost much to contribute, but those dinners are some of my fondest memories from high school, and I still enjoy getting together to have the same multicultural potluck with my friends today. Whether it’s scrapbooking, making homemade bath scrubs, creating wreaths, or working on some other kind of project, I love getting together with friends who love to be crafty and create something new. By asking each person attending to bring one element of the project, a Pinterest idea that might have cost $20 or more as an individual. Card game tournaments offer players a chance to embrace their competitive side. Some of my favorite get-togethers involve playing poker or Egyptian ratscrew well into the night. The high pace and competitive drive of the games provide hours of cheap entertainment, all while everyone’s having a great time. I’d hate to leave out board games on a list of frugal ways to spend time with friends. I’m not talking boring Monopoly, though. Telestrations, Never Have I Ever, and Cards Against Humanity always leave my friends and me in stitches. I, admittedly, never had a wine tasting party as a child of course, but it one of my favorite party ideas as an adult. Invite your guests to bring their favorite bottle of wine to share. Setting up a “tasting” party by setting out the open bottles of wine and little Dixie cups and have every vote on which wine is their favorite. There are some fantastic bottles of wine that cost just between $10 and $20 dollars. Wine parties are a fun, inexpensive adult way to hang out. If you have to spend money to have fun with your friends, then it might be time to reassess your priorities. Friendship is about quality time and connection, not how much your get-togethers cost. The next time your friend or group of friends suggests an expensive outing, ask them if they’d be willing to meet up for one of these frugal activities instead. What are your favorite frugal ways to spend time with friends? Love your ideas! I personally think that hiking is a great and frugal way to have an awesome time with friends. It doesn’t cost anything, is fun and soooo rewarding once you reach the top of the mountain ?